THANK YOU for supporting our Island Gala! Funding innovative programs ​to inspire young minds. JEF has been supporting Jamestown’s youth for over 12 years and community support is what keeps us going. ​We are an all-volunteer organization committed to carrying out our mission and aiding activities that inspire young minds, enrich our youth’s lives, and encourage life-long learning. 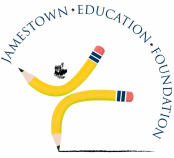 You are invited to explore the many successful programs we support, learn about Jamestown students' amazing achievements, and get involved by attending an event, applying for a grant, or making a donation.